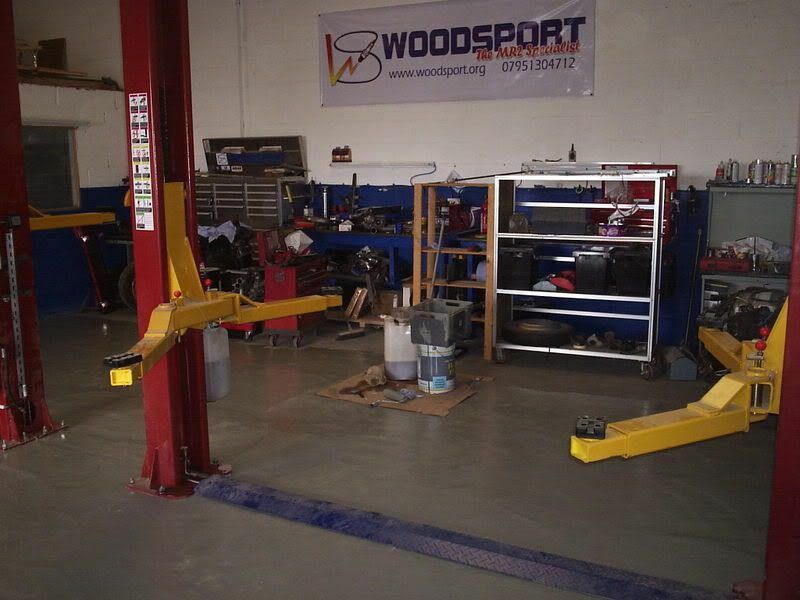 The Woodsport Workshop is fitted out with two 2-post lifts - nicknamed Samson and Goliath. This image has been resized. Click this bar to view the full image. The original image is sized 800x600 and weights 86KB. The reason for the names is that Paul grew up in Belfast, - and this is also where the Harland and Wolff Ship Building Cranes are located (of Titanic building fame). They dominate the Belfast skyline and are named Samson and Goliath. So, we at Woodsport have adopted those names for our own lifts. 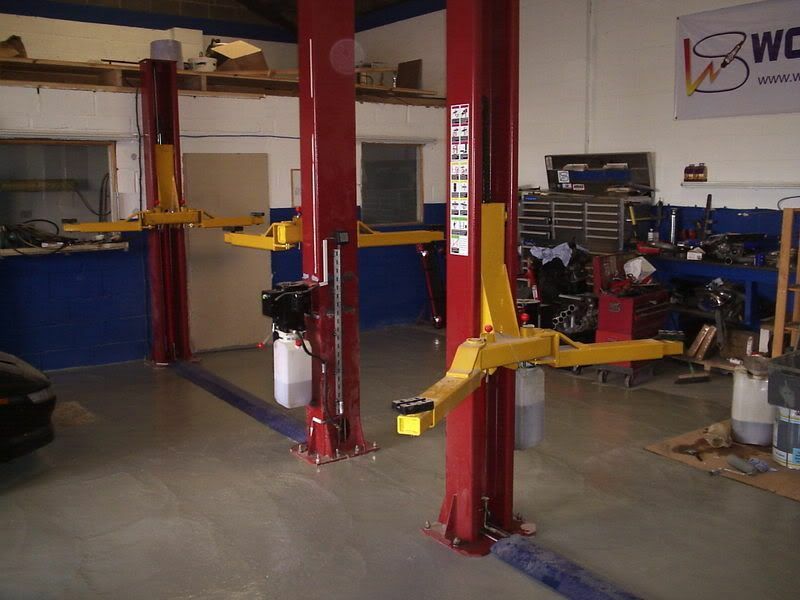 We also have a fully set up bodywork and spray booth area for painting work,a small office,toilet facilities and a coffee machine for free customer use. 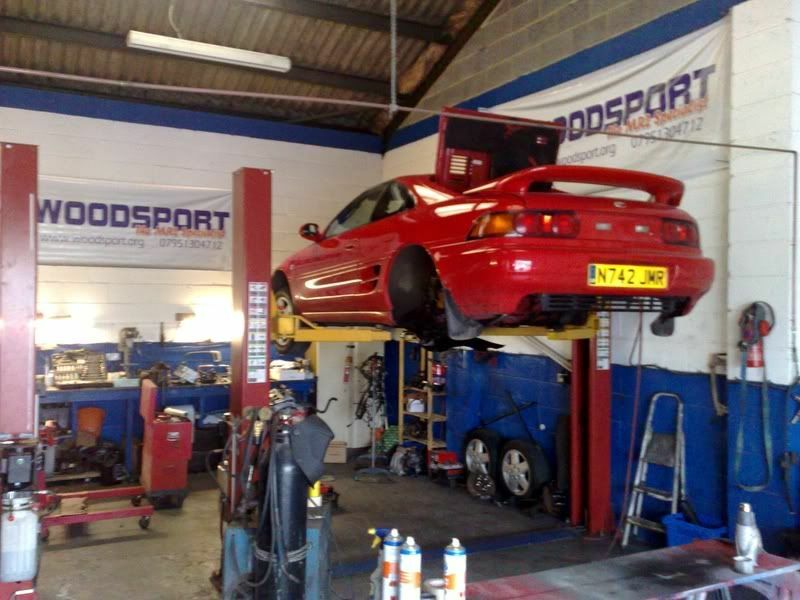 I've had my MR2 (Rev 2, Mk2, 3vz-fe track day car) for about 5 years now and have used "other well known companies" to get work carried out. 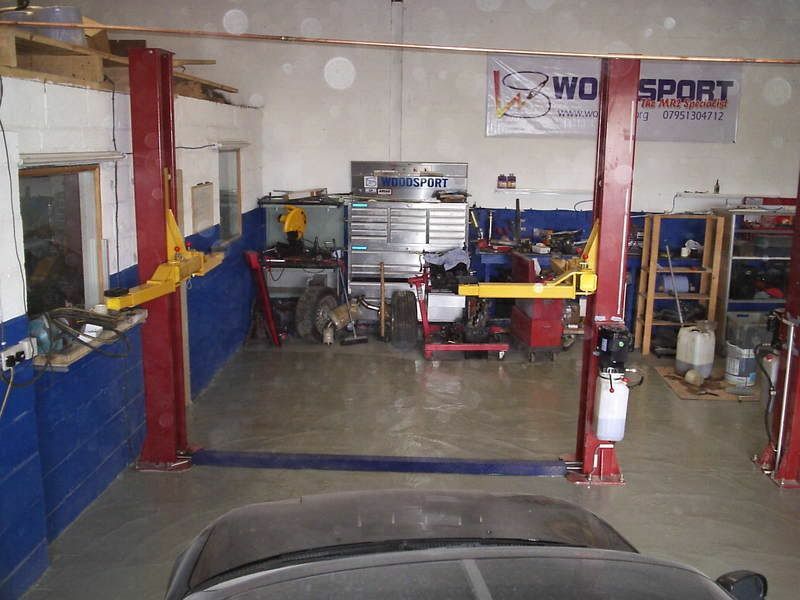 I turned to Woodsport as I wasnt 100% satisfied with previous work carried out and through these forums Paul (and company) appeared to be honest and very knowledgable plus priced at a fair price. I've been dealing with Woodsport / Paul over the course of the past 2 years as we've tried to find a 2gr-fe in the uk at a sensible price (highest quote was £8000.00 + VAT if anyone is interested..) Didnt have much success at finding one at a sensible price and so the plan to 2gr-fe it was abandoned and I comissioned Woodsport to complete the following works for my track car. In ALL of my dealings with Woodsport over the past 2 years I can honestly say I have had nothing but good advice and quick replies to my emails / phone calls. It wasnt unusual for me to email Paul and have a reply back the same day. I sent my car up to Paul about a month ago via a car transportation company and then drove the 604 mile round trip with a friend yesterday to collect her. I can honestly say that the work has been carried out to an exceptional standard. Woodsport going so far as rectify a few things which also needed doing, but at no additonal cost. Outstanding service! Its pretty obvious that Woodsport are very busy and yet I didnt feel as though it was a case of "hi,.. here is your car.. thanks bye!". Paul took the time to give us a tour, we got a ride in the Rav6 (hilariously good fun :D) and saw/heard the Mk1 V8. Video doesnt do the Mk1 justice.. it has to be heard to be appreciated. We got to look at other cars Woodsport were working on and the attention to detail was superb. I guess it should come as no surprise that Woodsport get a full 10/10 from me. THANK YOU VERY MUCH Woodsport / Paul!! Very rare for me to find a company that I can unreservedly recommend.